November 19, 2010 -- Granma -- The 6th congress of the Communist Party of Cuba will take place in April 2011 and the only topic of discussion will be the analysis of the country's economic and social model. Prior to the congress, from December 2010 through February 2011, a process of popular debate will unfold based on a fundamental party document entitled "The Economic and Social Policy Development Project", which is already in the hands of the people, a sampling of whose opinions Granma offers. November 7, 2010 – Links International Journal of Socialist Renewal -- Cuba is doing more than any other country in the world to reverse the “brain drain” of doctors abandoning impoverished areas. A physician who leaves Sierra Leone for South Africa can earn 20 times as much. Higher pay in English-speaking countries lures medical graduates from India (10.6% of doctors), Pakistan (11.7%), Sri Lanka (27.5%), and Jamaica (41.7%). Only 50 of 600 doctors trained in Zambia remained there after independence. There are more Ethiopian doctors in Chicago than in Ethiopia. The Cuban alternative is the 11year old Escuela Latinoamericana de Medicina (ELAM, Latin American School of Medicine). With their educational costs covered by the Cuban government, students focus on returning as doctors to under-served communities in their countries. The more than 20,000 medical students in Cuba receive much, much more than a free education — they are participating in a project to build a new model of medicine for the world’s poor. Students are well aware that they represent 1 of 100 countries, each of which has a unique relationship to the yoke of imperialism. "We are reorganising the workforce, not firing workers. We are directing them to other areas of work vital for the economy, mainly food production." November 3, 2010 -- Umsebenzi -- A South African Communist Party (SACP) delegation recently visited Cuba a part of its political interaction between South Africa and Cuba, and its quest to build socialism and strengthen ties between it and the Communist Party of Cuba. Yunus Carrim, editor of the SACP's monthly journal, Umsebenzi, interviewed Oscar Martinez, the deputy head of the International Relations Department of the Communist Party of Cuba. Published below is the full interview, as it appeared in Umsebenzi. Yunus Carrim: What is the nature of the economic problems Cuba is currently experiencing? October 27, 2010 -- On September 13, 2010 the Confederation of Cuban Workers (CTC) – the mass trade-union organisation that is a central component and pillar of the Cuban workers’ state and the revolutionary government headed by Raul Castro – issued an announcement which codified and specified new measures and significant changes in economic, financial and commercial policies that will be implemented in Cuba over the coming months and years. These new economic policies have been long-debated and broadly discussed inside Cuba from local grassroots mass organisations and work places to the highest levels of government and state. 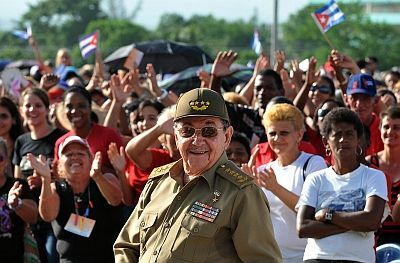 They come as a surprise to no one in Cuba. Fidel Castro addresses a huge crowd in front of the presidential palace in Havana, Cuba, in 1959. October 4, 2010 -- This is a response to "Cuba: Stalinism isn't socialism", by John Passant, a prominent member of Socialist Alternative in Australia. One of Marx’s unique and profound contributions to socialism is his idea that the emancipation of the working class is the act of the working class. This is the very reason Cuba isn’t socialist... Castro took power, but the working class as the working class played no role whatsoever in the overthrow of Batista. In fact they ignored Fidel’s call for a general strike in 1958. In reality the working class played a key role in the Cuban Revolution, through general strikes, mass demonstrations and by taking over their workplaces. For details, see my pamphlet Cuba: How the workers and peasants made the revolution. Download the pamphlet HERE or read on screen below. Urban organic food garden in Cuba. Dr José Bell Lara, professor at the Latin American Faculty of Social Sciences, University of Havana (FLACSO-Cuba), interviewed by Johannes Wilm. Bell Lara has written essays such as "Globalisation and Cuban Revolution" (2002) and "Cuban socialism within Globalisation" (2007), and is part of the international advisory board of the journal Critical Sociology. This interview was conducted in Havana in September 2010. Johannes Wilm: The Cuban government recently announced some changes. Among other things, it will be possible for more people to work independently. What is it that Cubans expect from these changes? September 24, 2010 -- Granma International -- On August 1 Cuba's President Raúl Castro Ruz announced to the National Assembly the decision to extend the self-employment sector and use it as an another option for workers seeking alternative jobs after the necessary reduction of the country’s inflated employment registers in the public sector. Various restrictions will be eliminated to allow the authorisation of new licences and the marketing of certain products, and greater flexibility to hire a workforce for certain activities. Many people have been waiting a solution that, far from being improvised or ephemeral, makes it possible to increase the availability of goods and services, while assuring an income to those who decide to do this work. It will contribute to the state being relieved of the burden of excessive subsidies, while placing in non-state hands the production of goods and services which it has provided for years in spite of the difficult economic context. September 22, 2010 – Venezuelanalysis.com – In Venezuela, “social investment has become a national strategy to achieve the Millennium Development Goals”, said Jorge Valero, Venezuela's ambassador to the United Nations, in his September 21 speech at the UN summit in New York analysing progress towards reaching the Millennium Development Goals. In the year 2000, 189 countries agreed on Millennium Development Goals to be achieved by 2015. The current summit, which began on September 20 and closed on September 22, aimed to analyse countries' individual and global progress towards reaching those goals. Government representatives from 140 countries were present. Journalist Jeffrey Goldberg (left) with Fidel Castro. Photo by Periodico26. September 14, 2010 -- Misunderstandings over Cuba run very deep, and not just among the enemies of socialism, or those who have had little contact with the country. Naturally, people are influenced by the corporate media, which wages a ferocious and relentless propaganda campaign against the little independent island. As Salvador Allende told the Chilean Senate in 1960 “day by day and minute by minute ... they [the corporate media monopolies] misrepresent what is happening in Cuba”. However, we can also see elements of what Edward Said called "orientalism" – a series of false assumptions about the country, conditioned by cultural prejudice. For example, the constant moral pressures of the revolution are often misinterpreted as state "coercion"; while a well-coordinated and caring health system has been derided as "paternalistic" and denying "choice" in health care. These are the results of trying to understand Cuba through a set of individualistic, liberal assumptions. Let's look at some recent misinterpretations. Earthquake damage in Christchurch. 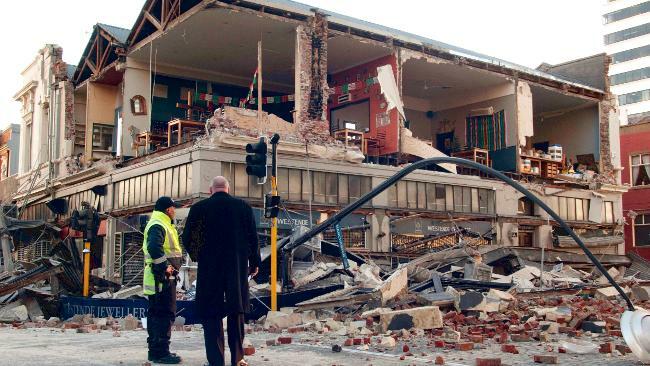 Although similar in magnitude to the January 2010 earthquake in Haiti that killed 250,000, nobody died in the September 5, 2010, New Zealand quake. September 8, 2010 -- Comparisons must be made between the impact of the September 5 earthquake on Christchurch, New Zealand, and the quake that hit Haiti in January. The nature of a global system that maintains these inequalities should be exposed over and over again. In Haiti – with a population of around 9 million – some 250,000 people died in the earthquake and (according to government figures) 200,000 were injured and 1 million were made homeless. Some eight months later disaster still grips peoples lives. Fortunately, but in a staggering contrast, no lives were lost in New Zealand, although the earthquake was of a similar -- but slightly more powerful --- magnitude (7 on the Richter scale). Market greed or a planned economy for human need? Despite the apparently secular nature of so much of modern life, religion is a long way from being a spent force. For revolutionary socialists aiming to mobilise the masses for a fundamental transformation of society, religion is a question which cannot be ignored. 1. While each country has its specific situation, in the West it is undeniable that the traditional religions are considerably diminished compared to even a few decades ago, with church attendances down and religious identification increasingly nominal for wide layers of the population. Moreover, the churches are being shaken by multiple and ongoing controversies and crises — over the role of women and gays, especially as priests; over revelations of past and present sexual abuse of women and children in their institutions; over financial scandals; in the case of the Roman Catholic Church, over damaging exposures of leading clergy flouting their own code of celibacy; over clashes between their conservative and more liberal wings; and over their increased integration into the activities of the state through government funding for charitable and welfare work. June 11, 2010 -- A major split over the US blockade of Cuba has emerged between domestic "dissidents" in Cuba and their former partners in Miami. The US corporate media is paying attention to what appears to be a new anti-Cuban strategy. A letter signed by 74 of the "dissidents" on the island calls for an end to Washington's ban on US citizens travelling to Cuba. On the other hand, most of the Cuban-American members of Congress are fiercely defending the nearly 50-year-old economic blockade, in all its forms. The "new contras" are now up against the old. The split represents a genuine difference in counter-revolutionary tactics, but is also linked to squabbles over money. For many years "dissidents" in Cuba have privately complained that most of the millions of dollars pledged by Washington -- for a "transition" to capitalist "democracy" in Cuba -- is snapped up by Miami. There have been scandals over the misuse of the millions of US government dollars funnelled into propaganda channels aimed at Cuba. Miami-based Radio Marti and Television Marti were recently criticised by US Foreign Relations Committee chair John Kerry as corrupt, ineffective and of little interest to young Cubans. 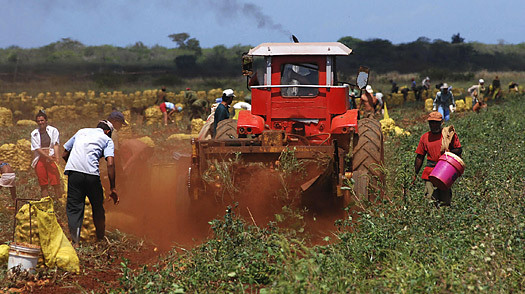 The battle for the world food system: an interview with Raj Patel from Jill Hickson on Vimeo. June 3, 2010 -- Raj Patel, author of The Value of Nothing and Stuffed and Starved, interviewed by Jill Hickson and Simon Cunich for Green Left Weekly and Links International Journal of Socialist Renewal. Patel discusses corporate dominance of global food production and battles to create democratic and sustainable food systems. June 1, 2010 -- Eva Golinger is known for her analysis in the service of Venezuela’s peaceful revolution against the local oligarchy and the United States empire. She is a noted author (The Chavez Code: Cracking US intervention in Venezuela). A dual citizen of the US and Venezuela, she is an attorney, and a personal friend of President Hugo Chavez. She is a frequent contributor to left-wing media around the world, and is the English-language editor of the Venezuelan newspaper, Correo del Orinoco. May 29, 2010 -- The case of Elian González, a six-year-old boy abducted by his unknown-to-him great-uncles and against the will of his father, in clear defiance of US law and decency, was widely reported by the media around the world. Miami, the place of the kidnapping, became a kind of secessionist city in North America when the mayor, the chief of police, the politicians, every newspaper and local radio and TV broadcasters, together with religious and business institutions, joined notorious terrorist and violent groups in opposing court and government orders to free the boy. It was necessary for a special forces team sent from Washington DC to launch a surreptitious and swift operation to occupy several houses, disarm the heavily armed individuals hidden there and in the neighbourhood to save the child and restore law. Everybody followed that story. Day in and day out. But practically nobody knew that, at the very same time, in exactly the same city, Miami, five other young Cubans were arbitrary deprived from their freedom and subjected to a gross miscarriage of justice.